Briefing the Security Council Monday, Special Coordinator Robert Serry looked back on 2013 as an important year for the peace process, as the parties were now engaged in a serious effort to implement their commitment to a negotiated two-state solution. Serry is hoping that this effort would lead, next year, to decisive and irreversible progress towards a comprehensive settlement realizing the vision of two states for two peoples. 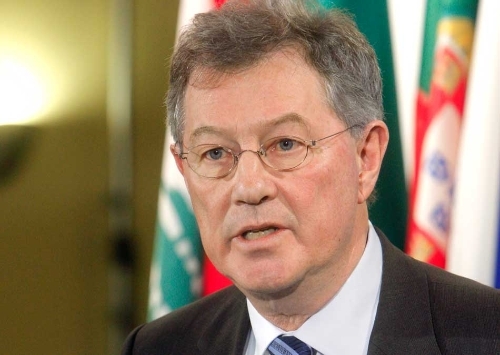 Serry said: "If both parties, with continued effective support by the international community, take the bold steps needed to see through what they have started this year, we will reach in 2014 a moment of truth regarding a two-state solution". Serry reiterated the UN's concern about the fragile situation on the ground. With the third prisoners' release approaching, he urged both sides to refrain from steps that would increase mistrust and undermine the prospects for progress in the critical period ahead "when bolder decisions are required to bridge the gaps towards a final status agreement." Serry warned that continued settlement activity cannot be reconciled with the goal of the two-state solution and is illegal under international law. He also voiced concern about recurrent violence and incitement. The Special Coordinator briefed the Council on the impact of current inclement weather in Gaza where, as a result of heavy flooding, around 10,000 people had been displaced. The UN on the ground was actively engaged with relevant parties to address the most urgent issues. Israel had provided four water pumps for Gaza and expanded operations at Kerem Shalom. Serry was pleased the Gaza Power Plant had resumed operations as of yesterday thanks to Qatar's donation of USD 10 million for the Palestinian Authority to purchase fuel for the Gaza Power Plant. "This is an important, but by no means sufficient development to start addressing Gaza's structural energy problem". The Special Coordinator noted positively the decision of the Government of Israel to resume the transfer of construction materials for UN projects in Gaza, under an agreed mechanism for the secure transfer and use of this material. "The current relative calm points to the importance of preserving the ceasefire understanding of a year ago, also as a basis for progress on other issues, including the further opening of the crossings". In this regard, he highlighted the importance for Israel to reinstate its decision to allow construction materials for the private sector into the Strip. 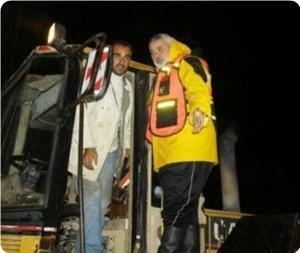 Head of the Gaza municipal authority Rafik Makki said that the rescue teams had managed to deal with the impacts of the air depression that hit the besieged Gaza Strip using worn-out equipment and vehicles because of the absence of other alternatives. 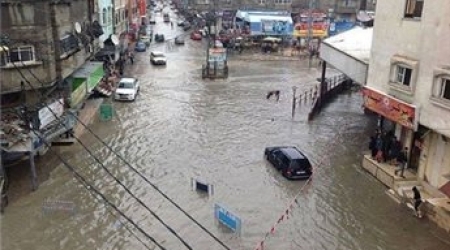 Makki told a news conference held on Al-Nafak street that the municipal authority had prepared its units and put them on full alert before the first rainstorm hit Gaza, but the amounts of rains exceeded all expectations. 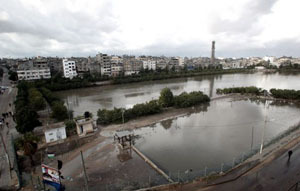 "I would like to remind our people and the whole world of that report which was issued by the UN and said that Gaza would be uninhabitable by 2020 because of the scarce potable water, but God has sent us this fresh water to support our steadfastness in the face of injustice and siege," the municipal official stated. In a related context, minister of labor and social affairs Mohamed Al-Raqab said that during the next 24 hours, all evacuation centers established by the government for the families affected by the recent rainstorms would be closed. Raqab stated in a news conference on Monday that the government had formed an operations center to follow up and address the impacts of the disaster, noting that 7,312 Gazan families were directly affected by the rainstorms. 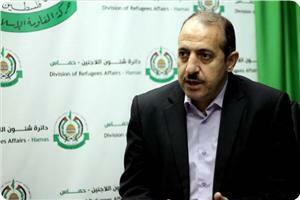 He added that the government had to open 21 shelter centers in all Gaza districts, except Rafah area. The official affirmed that his ministry had worked during and after the disaster on providing relief assistance to the citizens to mitigate its impacts. He appealed to UN secretary-general Ban Ki-moon to necessarily move to have the Rafah border crossing permanently opened before movement of goods and individuals. As thousands in the Gaza Strip remain displaced and streets across the coastal enclave are still flooded Tuesday, it is increasingly clear that the devastation caused by storm Alexa was not a purely natural phenomenon. Emergency response crews have been crippled by a lack of electricity to pump water and a lack of fuel to operate generators. But these conditions of scarcity are not a result of the storm. They were a fact of life even before the rain started falling, due to the Israeli-led siege and the severe limitations placed by Israel on imports and exports. It is hard to separate the severity of the storm’s effects from the seven years of siege the region has endured, a near-total economic blockade that has led to a slow but steady collapse of infrastructure as well as a deeply weakened capacity for emergency response. "Long term de-development of Gaza is the context in which (the storm) occurred," UNRWA spokesman Chris Gunness said Sunday in an interview. "It's fairly obvious that it's a combination of man-made problems and natural problems" that produced the latest disaster in Gaza, Gunness added. He pointed out that despite the tremendous amount of work being done to relieve the crisis, it is an "overwhelmingly grave situation." "Before the rains, there was sewage flooding in the streets because sewage pumps did not have electricity to pump waste water," Gunness said, referring to a number of incidents in recent weeks. "You don't have to be a rocket scientist to figure out who's responsible for that." Despite Israel's opening of the Kerem Shalom border crossing into Gaza on Sunday to deliver 450,000 liters of fuel donated by Qatar, Gunness remained pessimistic. "Short-term measures are essentially meaningless to people living in Gaza," he said, adding that "these solutions are only about the hours to come, but we need to be thinking about the coming decades." "We in the UN have always said that this policy is unsustainable ... When the natural disaster ends, we need to look at long-term solutions," he added, stressing the need for limitations on exports from Gaza to be lifted. "Gaza would not be so aid-dependent if it could export. People would have disposable incomes to buy the things they need," he added, pointing out that if the limitations of trade were lifted Gaza would be "transformed." In the meantime, however, Palestinians in Gaza remain swamped with dirty, cold water, as rescue workers and clean-up crews work overtime under desperate conditions to address an increasingly dangerous humanitarian crisis. 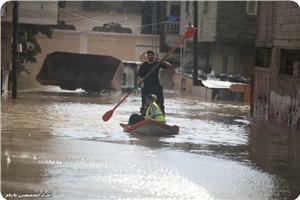 Over the last week, Gaza has been battered by a storm on a level unprecedented in decades. At last count, somewhere between 10,000 and 40,000 residents have been displaced from their homes, while streets across the coastal enclave are flooded with dirty water, in some places up to half a meter. The images coming out of Gaza are apocalyptic, as the civil defense services and residents alike take to fishing boats to rescue those trapped in their homes days after the storm's initial onslaught. Even those who managed to stock up on food and water in anticipation of the storm's approach found themselves stuck in record cold temperatures for days, as the electricity supply fell at times to one or two hours. In some areas the power went out completely for two full days, leaving people to warm themselves under blankets as their homes were pounded by ferocious winds. The water supply was, as always, erratic, cutting in and out depending on when pumping stations had enough electricity to send it out. And generators were rendered useless for many, as the severe fuel shortage that began in November meant that even those institutions lucky enough to have back-up generators often had trouble getting them to work. The lack of electricity, in turn, crippled emergency response efforts. Even as thousands of Gaza employees worked day and night to address the crisis, the lack of power meant that pumping water from flooded areas became a task of monumental proportions. Some 1.7 million people crammed into 40 sq. km. were effectively trapped and left to their own devices. Devices which have suffered significant deterioration themselves after nearly seven years of intense blockade. Israeli authorities say that the blockade was imposed after Hamas won democratic elections in 2006 as a form of political sanction. But this political sanction has so far failed to have any clear result except to massively punish the civilian population, while Hamas maintains control over an increasingly impoverished and isolated population. Israeli authorities are keen to remind the international community that they are committed to helping the people of Gaza, a fact they publicize with frequent token gestures of goodwill. The Israeli armed forces announced Friday that it had opened the Kerem Shalom crossing to transfer heating gas and four water pumps to help with the crisis. But the army failed to mention that the same siege that created a situation of widespread fuel shortages and power blackouts would also render the water pumps ineffective for the large parts of the day when Gaza's electricity network goes dead. Another example of the pervasive traces of the siege in the latest crisis comes from the Gaza port, which took a severe beating in the storm. Gaza officials announced Monday that the port and the fisherman’s dock, which sustains the families of 1,000 local fishermen, had suffered $100,000 in damage over the last four days. The reason for this tremendous damage, officials argued, is because port officials were unable to secure the port with enough concrete barriers -- because Israel severely limits the import of concrete. "Without drastic action the daily lives of Palestinians in Gaza will soon be dramatically worse than they are now. There will be virtually no reliable access to safe drinking water, standards of healthcare and education will have continued to decline, and the vision of affordable and reliable electricity for all will have become a distant memory," a 2013 UNRWA report [PDF] entitled “Gaza 2020” predicted. As large swathes of Gaza remain flooded and the Israeli blockade continues with no end in sight, it is hard not to think that this dystopian vision of the future has already come to pass. Gaza will weather this storm, as it has every storm and assault before in its long history. But as long as the Israeli siege persists, meaningful repair and development will remain impossible. 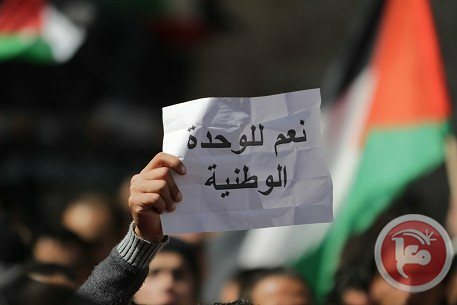 A Palestinian holds a sign reading, "Yes to national unity." Hamas has officially notified Palestinian president Mahmoud Abbas of the movement's decision to join a national unity government which will prepare for upcoming presidential and parliamentarian elections, sources told Ma’an on Tuesday. The sources, allegedly privy to the details, said that Abbas had previously received two phone calls from Hamas' chief Khalid Mashaal and from prime minister of the Hamas-run government in Gaza Ismail Haniyeh. 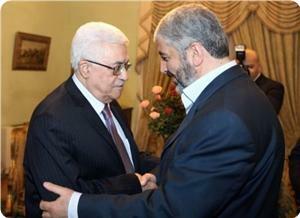 The two allegedly confirmed to Abbas that Hamas had agreed to join a national unity government with Fatah. The sources pointed out that Hamas requested that the national unity government serve for six months instead of three as agreed in the 2012 Doha Agreement, one of numerous attempts at reconciliation between the rival Palestinian factions. Abbas might ask current Palestinian Authority prime minister Rami Hamdallah to lead the unity government, sources said. The Palestinian president will issue the needed presidential decrees announcing elections after attending a meeting of Arab countries' foreign ministers scheduled on December 21, sources added. The two main rival Palestinian parties have been on cold terms since 2006, when Hamas won the Palestinian legislative elections. In the following year, clashes erupted between Fatah and Hamas, leaving Hamas in control of the Strip and Fatah in control of the West Bank. Member of Hamas's political bureau Saleh Al-Aruri said that the 26th anniversary of his Movement's inception has arrived this year as it is much stronger and more popular than ever before. Aruri made his remarks in a statement to Al-Intilaka newspaper, which is released and distributed by Hamas on its launch anniversary in the West Bank. The Hamas official stated that his Movement is deeply rooted in its Palestinian society and the past years proved its ability to develop and remain steadfast in the face of obstacles. He outlined the Movement's most prominent achievements during the past 26 years of its presence and the role it has played since its inception in protecting the Palestinian cause. The official also pinpointed the rules and principles on which Hamas build its relations with others, affirming that these relations are governed by the Palestinian people's goals and aspirations. Aruri held the Fatah-controlled Palestinian Authority fully responsible for the decline of resistance activities in the West Bank as a result of its security cooperation with the Israeli occupation forces. Civil Society Organizations of the OIC(Organization of Islamic Cooperation) called in its 5th conference held in Istanbul for providing urgent help to address the repercussions of the humanitarian situation in the Gaza Strip. The conference recommended a broad international campaign to act urgently to meet Gaza’s emergency needs. It commended the organizations that pledged to provide relief to Gaza, noting that in its first stage , it denoted US$7m to limit the negative impacts of the harsh winter. It also praised Secretary General of OIC Akmal El-Deen Ihsan Oglu for appealing to help Gaza from cold and flood. The conference expressed concern over the deteriorating situation in the refugee camps in Syria, calling on all humanitarian organizations in the OIC to send assistance to them in order to face the heavy cold winter. Darkness, shortage of fuel, flooding, hunger. Two Palestinians were killed and thousands evacuated to shelters while international community is blind and keeps silence like nothing is happening. During the last two days thousands of Gazans were evacuated from their homes because of the flooding caused by the storm “Alexa” that invaded the Middle East and has covered it with snow, rain and hail. 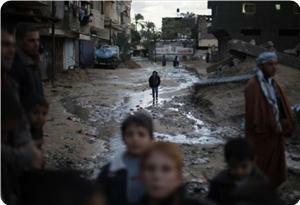 Chris Gunness, The UNRWA spokesperson, has described the Gaza Strip on Sunday, Dec. 15 2013 as a “disaster area”. He called on the international community to send relief for the Gazans and to lift the Israeli blockade for human reasons. Gaza also lives in continuous darkness due the cut of electricity because of the shortage of fuel. Over the last few years, the Gaza Strip has largely relied on the fuel coming in from Egypt through the cross-border smuggling tunnels under Rafah. Egypt has demolished hundreds of smuggling tunnels earlier this year. The Gaza Strip uses about 120 megawatts of electricity purchased from Israel and about 27 megawatts from Egypt. Power outages are something that Gaza has dealt with for years. Israel’s restrictions on the amount of fuel Gaza could import, together with supply from Egypt not always being reliable, meant regular cuts for homes and businesses, hospitals, schools and even basic infrastructure. But after several years, the shortages have finally grown so severe that the plant can no longer operate at all. Blackouts now last for an average of 16 hours a day. With the essentials of daily life compressed into only a few hours, it is no wonder that Gaza and its residents – young and old, women, men and children alike – are tense and anxious. They were able to extinguish the fire quickly, but now, Daulat stays up until everyone else has gone to bed, to make sure she blows out the candle. And then, until morning, there is darkness. Khitam explains that getting up at night means stumbling over furniture or running into walls; her brother, afraid of going to the bathroom in the dark, has been wetting the bed. Palestinian Authority President Mahmoud Abbas said he rejected a boycott of (Israel) on December, 9, infuriating Boycott, Divestment and Sanctions (BDS) leaders, The Star reported. “No, we do not support the boycott of Israel,” Abbas told South African reporters. 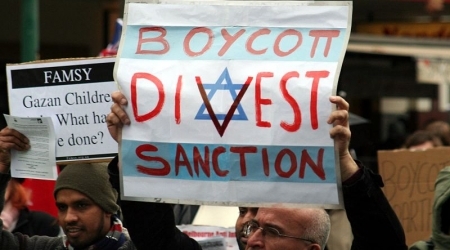 “But we ask everyone to boycott the products of the settlements. Because the settlements are in our territories. It is illegal,” Abbas added. “But we ask everyone to boycott the products of the settlements. Because the settlements are in our territories. It is illegal. … But we don’t ask anyone to boycott Israel itself. We have relations with Israel, we have mutual recognition of Israel,” Abbas added. According to Ali Abunima, a co-founder of Electronic Intifada, a Palestinian US-based platform committed to combating the pro-Israeli, and pro-American spin, "it is unclear what Abbas meant by 'mutual recognition'"
"While Abbas and the Palestine Liberation Organization have recognized Israel, Israel does not recognize a Palestinian state or indeed any Palestinian rights whatsoever and continues to aggressively steal Palestinian land," Abunima said. Abbas’s comments conflict “with the Palestinian national consensus that has strongly supported BDS against Israel since 2005,” BDS movement co-founder Omar Barghouti told Electronic Intifada. 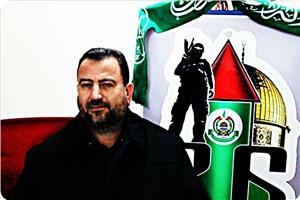 Barghouti said Abbas does not speak for the Palestinian people. “There is no Palestinian political party, trade union, NGO network or mass organization that does not strongly support BDS,” he said. “Any Palestinian official who lacks a democratic mandate and any real public support, therefore, cannot claim to speak on behalf of the Palestinian people when it comes to deciding our strategies of resistance to Israel’s regime of occupation, colonization and apartheid.” Barghouti stressed. The Palestinian legislative council (PLC) called on the Arab parliament convening in Jordan to send a parliamentary delegation to visit the Gaza Strip and see closely the suffering of the citizens and the size of damage caused by rainstorms. This came in press remarks made on Sunday by first deputy speaker of the PLC Ahmed Bahar during his tour of the areas affected by the heavy rainstorms that hit Gaza during the last few days. Bahar and some of his fellow lawmakers met with many families who had taken refuge in Khan Younis Martyrs School after their homes were swamped by rainwater, and visited other affected areas. Bahar hailed the considerable rescue and relief efforts that had been made during the disaster by the civil defense forces, municipal workers, grassroots committees and the resistance factions. The lawmaker appealed to the UN, the Arab League, the organization of Islamic cooperation, the Islamic relief organization and the world's parliaments to send urgent humanitarian aid to Gaza. 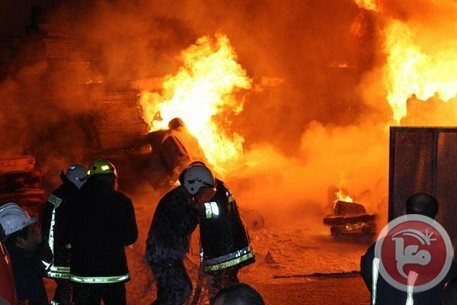 A house in Nablus was destroyed by a fire overnight Sunday after residents used candles during power cuts in the northern region, a PA official said. Ghassan Daghlas told Ma'an that the Daragmah family home was destroyed by the blaze after family members used candles to light the house during a power cut. Firefighters arrived and contained the blaze. No injuries were reported. More than 20 villages and neighborhoods in Nablus district in the northern West Bank were without electricity for at least last four days after an electricity network collapsed following adverse weather conditions. The Palestinian government in Gaza called on the Arab and Islamic countries to follow the lead of Qatar and stand by the storm-hit Gaza Strip. Emir of Qatar Sheikh Tamim Al-Thani had channeled 10 million dollars to solve the fuel crisis temporarily until the arrival of Qatari fuel shipments sufficient to operate the Gaza power plant for about three months. 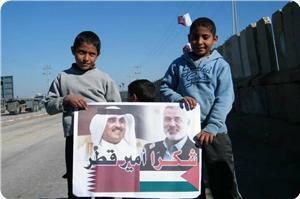 Sheikh Tamim also allocated five million dollars to aid the Gaza population affected by recent rainstorms. Spokesman for the government Ihab Al-Ghussein told a news conference on Sunday that Qatar was the only Arab country which felt the suffering of the Gaza people and hastened to help them. Spokesman Ghussein expressed his government's thanks to Emir of Qatar Sheikh Tamim Al Thani for his generous assistance to the Gaza people. Palestinian premier Ismail Haneyya on Sunday phoned Sheikh Khalifa Bin Zayed, president of the United Arab Emirates (UAE), and put him in the picture of the humanitarian situation in the Gaza Strip after it was lashed by heavy rainfall. His office stated in a brief press release that premier Haneyya congratulated Sheikh Khalifa on the national day of the state and hailed the historic role of his country in supporting the Palestinian people and their just cause. Sheikh Khalifa, in turn, said that his country would keep supporting the Palestinian people and pledged to do his utmost to help the population in Gaza and alleviate their suffering. The premier had phoned several leaders and top officials of Arab and Islamic countries to urge them to extend a helping hand to the Gaza people who were afflicted with devastating rainstorms. Director of Hamas's refugee affairs bureau Isam Adwan said that the UNRWA must assume its responsibilities well towards the Gaza population, especially in times of crises and emergencies, in accordance with the humanitarian principles it was founded on. "Are not there any crises in the Gaza Strip that require urgent intervention by the UNRWA," Adwan stated in press remarks on Sunday. The Hamas official expressed his dismay at the UNRWA's weak humanitarian role in Gaza, which is racked by crises and disasters, most notably, the ongoing blockade and the recent displacement of many citizens as a result of floods. The official accused the presidency of the UNRWA of receiving exorbitant salaries without being up to the tasks it was assigned to do, stressing that this presidency must fulfil its commitments or resign. Civil defense forces in Gaza city are battling the stormy weather hitting the city and trying hard to deliver a child incubator needed urgently for an infant from Al Zanoon family who was born premature and suffers from lack of immunity. 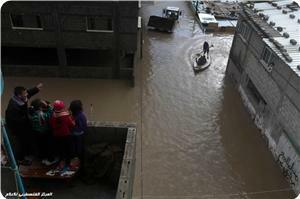 As major flooding forces 10,000 people out of their homes, delivery allows Gaza's only power plant to resume operation. The Gaza Strip's lone power station has resumed operations for the first time in more than seven weeks, after the besieged Palestinian enclave received a long-awaited delivery of diesel fuel. Israel allowed the entry of 450,000 litres of fuel, paid for by Qatar, into Gaza on Sunday in response to an emergency appeal for aid after torrential rains and flooding killed two people and forced the evacuation of more than 10,000 residents from homes throughout the territory. Qatar will send $10mn to Palestinian President Mahmoud Abbas's Palestinian Authority (PA), which ordered the fuel from Israel. Those supplies, officials said, should keep the power plant partially operating for at least 90 days. The plant supplies some 30 percent of Gaza's electricity needs. "The first generator has started working, the second one will follow, and by this evening, the company should be able to generate around 60 megawatts of electricity," Jamal Dirsawi, spokesman for the Gaza Electricity Distribution Company (GEDCO), told the AFP news agency. "This will give GEDCO an opportunity to provide more hours of electricity to citizens." 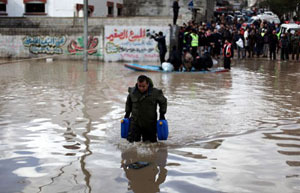 The emergency fuel distribution was expedited on Friday after a major winter storm hit the region, and the United Nations declared Gaza, which suffered from major flooding, a "disaster area". In a statement on Sunday, the UN humanitarian agency OCHA said the storm had caused damage to electricity feeder lines from Egypt and Israel, further exacerbating the power problem. The Hamas-run government in Gaza said Qatar will also send a ship loaded with fuel to Israel's Mediterranean seaport of Ashdod for later transfer to the Gaza Strip, and allocate $5mn to help Gaza residents affected by the storm. The 1.8 million Palestinians in the Gaza Strip have endured daily blackouts of up to 16 hours since the power plant was switched off 50 days ago. The territory lacks basic civil infrastructure and lives under an Egyptian-Israeli blockade meant to cut off arms flows, but which also curbs imports of fuel, building supplies and basic goods. The widespread fuel crisis has affected private homes, schools and hospitals, businesses, and water and sanitation plants. Hamas has blamed the situation on Egypt's destruction of 1,200 cross-border tunnels which had in the past been used for bringing fuel into Gaza under the Israeli blockade. They have also accused the PA of charging too much for fuel. Fathi al-Sheikh Khalil, the deputy head of Gaza's energy authority, said Sunday's fuel delivery would half the number of hours without power. "The power station will start working and the service will be available gradually, returning to the former programme of eight hours with electricity and eight hours without," he told a news conference. The death toll in the Gaza Strip from winter storm Alexa rose to two on Sunday as more than 2,000 Gazans remained in shelters and much of the region was still paralyzed after four days of severe weather. Gaza government said that the direct material losses of the bad weather that hit the Strip were estimated at 64 million dollars, and that the rescue teams succeeded to control the situation, despite the lack of equipment and the blockade. Minister of Public Works and Housing Yousef Gariz reviewed, during a press conference held on Saturday evening at the headquarters of Ministry of Information in Gaza, the details of losses left by the bad weather conditions, pointing out that about seven thousand families were displaced from their homes. He said: "More than 3,300 houses were flooded and nearly one thousand others were damaged. Material losses of these residential units were estimated at about 40 million dollars." Regarding the industrial and commercial sector, nearly one thousand shops and industrial installations have been damaged so far, with losses estimated at U.S. $ 3 million, while the losses of the agricultural sector reached seven million dollars. The minister stressed that the Palestinian government in Gaza has been working non-stop to confront the difficult conditions and save the citizens. A young man in the city of Khan Younis in the southern Gaza Strip died on Saturday of asphyxiation from a fire he was kindling in his room to stay warm, while 96 other citizens were wounded during the storm that hit the Palestinian territories. 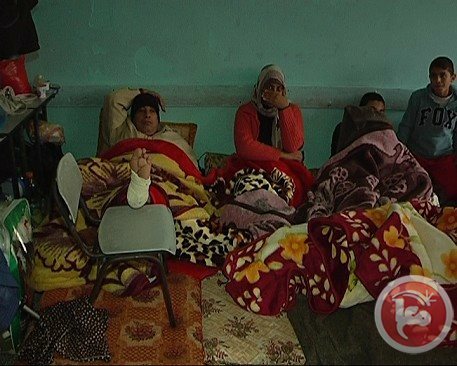 The government Information Office said in a statement on Sunday that 804 families, comprising 4,316 people, took refuge in the shelters that have been opened across the Gaza Strip during the storm that hit the region for 4 days. 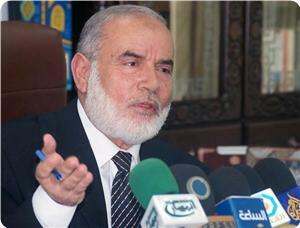 For his part, Hamas leader Dr. Mahmoud al-Zahar said that because of the deteriorating situation in the Gaza Strip some Arab countries have announced that they will provide assistance to Gaza. More than 20 villages and neighborhoods in Nablus district in the northern West Bank have been without electricity for the last four days, causing huge losses to farmers and private properties. Executive director of the Northern West Bank Electricity Company Yahya Arafat told a Ma'an reporter that the electricity network completely collapsed just as the storm started to hit the district, leaving the entire region powerless throughout the storm. The company lost 66 of its 88 megawatt capacity at that time, effectively cutting off service to 95,000 customers, he added. operating round-the-clock trying to fix the issues with the networks, as of Sunday the region was still powerless. In the newer parts of Nablus, Arafat said, only seven houses had been left without electricity because repair teams were unable to access them due to heavy snowfall of up to a meter. Arafat said the main problem facing those regions without power was related to the main grid providing electricity from Israel. As of Sunday, an Israeli company was still trying to reinstall seven transmission towers that had collapsed completely, but Arafat said that the Israeli company had said they still needed 48 hours before their work would be complete. In the mean time, more than 20 villages and neighborhoods south of Nablus remain in the dark. Deputy mayor of Awarata village south of Nablus Qays Awwad highlighted said that hundreds of olive trees have been damaged as a result of the storm and dozens of steel structures used for livestock were destroyed. Large numbers of poultry in steel structures, added Awwad, could die as a result of power cuts. A poultry breeder from the village of Tell west of Nablus Khalid al-Sayfi told Ma'an that he suffered losses of up to a half million shekels ($145,000) after the roof of his farm collapsed. He said that when he woke up in the morning, he received a phone call from the landlord who owns the farm building telling him that the roof fell to the ground as a result of piling snow. "The roads were completely closed to traffic, so I went with my brother on foot to the farm which is 3 kilometers away. When were arrived, we were agonized by the scene. The roof fell on the chicken." He added that he telephoned the civil defense services and the ministry of public works for help so he can save some of his birds, but nobody was able to do anything because all roads were shut down by snow. "We gave up hope after we waited four hours watching 7000 birds dying one after the other." Political bureau chairman of Hamas Khaled Mishaal reached PA chief Mahmoud Abbas over the telephone at a late night hour on Saturday and discussed with him tragic conditions in Gaza Strip. Sami Khater, political bureau member of Hamas, told Quds Press that the telephone contact was one the results of the recent meetings between delegations from Fatah and Hamas in Doha. 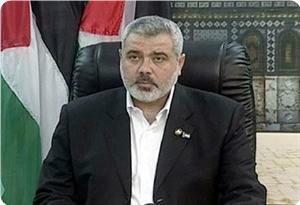 He said that Mishaal asked about progress of the negotiations with Israel, if any. He added that Abbas was informed that he went to the negotiations alone without the participation of any other Palestinian faction and that Hamas’s message to him was to stick to constants and not to surrender any of them. Khater said that Judaization threats to the Aqsa Mosque and Jerusalem were also tackled, adding that Mishaal affirmed that such issues should top the list of the Palestinian leadership’s priorities. Discussion then touched on the blockade on Gaza, Khater said and quoted Mishaal as saying that maintaining the siege on Gaza till now was not acceptable. Mishaal appreciated Abbas’s response to Gaza premier Ismail Haneyya’s phone call and his assistance to the Gaza population in face of floods, the political bureau member said. The telephone conversation also tackled the issue of reconciliation, Khater said, adding that Mishaal affirmed his movement’s commitment to all what had been agreed upon in this regard. The Hamas leader called for approving a unified Palestinian strategy to administer the “struggle with the enemy”, Khater concluded. 904 Gazan families ,including 4316 individuals, have been evacuated to 16 rescue shelters due to the extreme winter storm that hit the country in the last four days, Ministry of Social Affairs stated on Sunday. According to Omer al-Darbi, Undersecretary of Social Affairs , six rescue shelters were opened in the north of the Gaza Strip and sheltered 362 families, and another six shelters in the Gaza City for 375 families. Two rescue shelters were opened in Khan Younis for 51 families and another two in the central governorate to shelter 65 families. Al-Darbi said that ministry supply these families with food and blankets all the four days of the storm. “We have distributed 1500 food parcels, 1700 blankets, 8427 mattresses, 340 kitchen tools and 224 flashlights. He affirmed that the ongoing blockade lead to worsening the crisis since many houses in the Gaza Strip were in bad need for reparation. Al-Darbi said that the rescue shelters, which were opened in schools, will be evacuated tomorrow to resume school year. He mentioned that several organizations helped in providing relief to the affected families such as the Palestinian Red Cross, International Red Crescent, Oxfam, UNRWA and other local NGOs. He called Arab and Islamic countries to immediately provide help and relief to the Gaza Strip to repair its infrastructure. The port of Gaza and the fisherman's dock have suffered losses of up to $100,000 in the recent storm as an indirect result of the Israeli blockade on concrete blocks, a Gaza Ministry of Transportation official said Sunday. In a news conference held Sunday at the fisherman's dock, coordinator of the Gaza Harbors Said Ammar said that the dock had been severely damaged as a result of the storm, directly affecting the 1000 Gazan families who directly depend on the dock for their livelihoods. Ammar said that the wave breakers off the Gaza coast were not strong enough and as a result the port and the docks were battered by the storm, which began on Thursday. He added that there were attempts before the storm to strengthen the wave breaker with concrete blocks but these were done "haphazardly," as the coasts needed 5000 dolosse, or large concrete blocks, to be fully secured. "We couldn't obtain more than 600 dolosse because of the siege Israel has been imposing on the Gaza Strip," he added, referring to the Israeli blockade of the coastal enclave that limits concrete imports. A spokesperson for the Gaza Ministry of Transportation Khalil al-Zayyan, highlighted that the ministry managed to move more than 200 fishing boats from the dock in anticipation of the storm. He added that Israeli restrictions on entry of cement and other construction materials would severely impede repairs on the port of Gaza. Haniyeh visited a number of families who evacuate from their houses to Abu Hussein and al-Rafi primary schools in Jabalia. He listened to their demands and promised to help them to return to their homes. the first would be to save the citizens and clean up the effects of the water, count the damages and compensation, and the third stage is the implementation of strategic projects to reform the infrastructure of the most affected areas. He said that he discussed the suffering of Gazans with the Qatari president who donated ten million dollars for paying the taxes imposed by Mahmoud Abbas on diesel fuel. He told Abbas that it is a joined responsibility to run the current crisis in Gaza and provide assistance to more than million and a half Gazans. He praised Qatar for helping Gaza, pointing out that he contacted the Qatrai Ministry of Interior to allow the access of the Qatari fuel for the power station in Gaza. 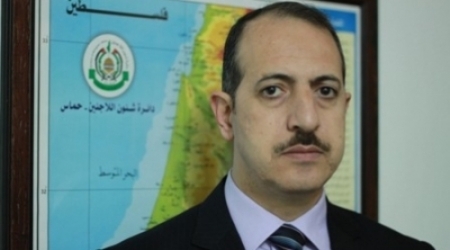 The head of Hamas Division of Refugees Affairs, Essam Audwan called on United Nations Relief and Works Agency For Palestine Refugees (UNRWA) to act its activities in Gaza as being a disaster area. He said on a statement on Saturday that Gaza faces an overwhelming disaster that requires an immediate intervene from UNRWA. He expressed his frustration with UNRWA "passive role" in dealing with the besieged Gaza, pointing to the last cold front and the torrential rain which hit Gaza and lift thousands of Palestinian houses flooded. He explained that Gaza field office of the UNRWA does not fully performed its duties towards Gazans " Either this administration carries out its duties or resign," he said. 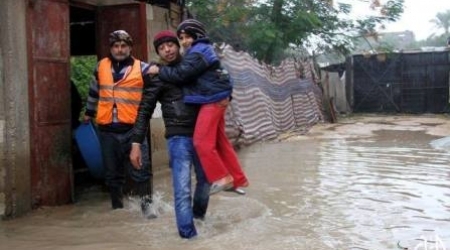 UNRWA Gaza field office in Khan Youns refused to provide assistance to the Palestinian refugees whose rainwater flooded their houses , media sources reported. Palestinian government in Gaza warned of an imminent humanitarian catastrophe in the Gaza Strip, because of the bad weather that exacerbated the suffering of the besieged people. The government called upon the world to exert pressure on the Israeli occupation authorities to allow entry of fuel to run Gaza's sole power plant, and to take the necessary measures to put an end to the suffering of Gaza residents. Isra Mudallal, a government spokeswoman, urged, at a press conference held on Saturday evening at a shelter center, the international community to shoulder its legal and ethical responsibilities to end the illegal blockade imposed on Gaza, and to provide humanitarian assistance to the people in order to prevent a humanitarian catastrophe. She said: "The acute shortage of fuel and the lack of equipment made alleviating the suffering of the people an almost impossible task," and noted that the blockade has caused serious adverse effects on all aspects of life. Mudallal added that the health sector in Gaza has been seriously affected by the crisis, while water services and sanitation have deteriorated due to lack of fuel and the restrictions imposed by the Israeli occupation. She stressed that since the very first moment the Palestinian government in Gaza declared a state of emergency and formed rescue teams that have been working non-stop to help the citizens in the affected areas, which became flooded due to heavy rainfall. 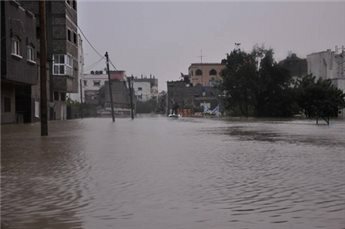 Flooding caused by heavy rains continues to paralyze the life of Palestinians in the cold days of the besieged Gaza Strip. 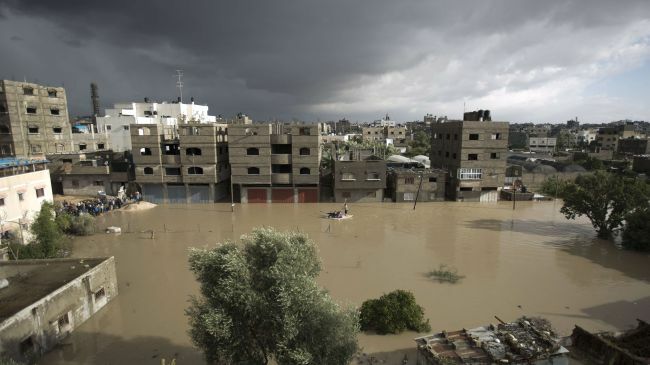 On Saturday, officials said that some 40,000 Gaza residents were displaced since the downpour began there late on Wednesday. The officials added that more than 5,200 people were taken to safety in fishing boats, military trucks, and heavy construction vehicles. The torrential rainfall is part of a storm that also covered some parts of the region with snow. “Currently, the sky is clear but the temperature in extremely cold,” said Press TV’s correspondent in Gaza. “What added salt to the injury is Israel’s opening of a dam, east of the Gaza Strip, for the second day today, flooding vast swathes of land” there, he added. He also said rescue operations were slow due to primitive equipment and lack of fuel, especially for emergency trucks. Chris Gunness, a spokesman for the main UN aid agency in the territory, said "The world community needs to bring effective pressure to end the blockade of Gaza," once the storm is over. Gaza residents "must be freed from these man-made constraints to deal with the impact of a natural calamity such as this," added the UN official. The refugee camp of Jebaliya in northern Gaza and Nafak Street in Gaza City's Sheik Radwan neighborhood, close to a rainwater reservoir, were among the hardest-hit areas. The majority of Gazans have been experiencing fuel shortages and power cuts after the territory's only power plant was shut down due to a fuel shortage last month. According to health officials, a man has died due to smoke inhalation after burning coal to warm his house. Fuel and electricity shortages in the Gaza Strip have also worsened due to Egyptian government’s closure of Gaza tunnels. These tunnels are the only lifeline for Palestinians living under the Israeli siege. Gaza has been blockaded by the Israeli regime since June 2007, a situation that has caused a decline in the standards of living, unprecedented levels of unemployment, and unrelenting poverty. Over 160 Palestinians, including women and children, were killed and about 1,200 others were injured in Israel’s eight-day offensive on the coastal enclave, which ended on November 21, 2012. The apartheid regime of Israel denies about 1.7 million people in Gaza their basic rights, such as freedom of movement, jobs that pay proper wages, and adequate healthcare and education. Palestinian premier Ismail Haneyya said that his government would carry out strategic development projects in the areas which were considerably affected by the air depression in order to avoid a similar disaster in the future, pointing out that the situation is under control despite obstacles. In press remarks during his tour of the affected areas in Gaza on Saturday evening, premier Haneyya stated that all ministries and Hamas institutions have been put on full alert to deal with the impacts of the air depression that hit Gaza. Premier Haneyya also outlined the rescue and relief efforts made by his government to help the citizens living in the flooded areas in addition to other measures that were decided to deal with the impacts of the rainstorms that caused wide material damage to homes and infrastructure. The premier hailed the Gazan citizens for their solidarity with each other and cooperation with the authorities during the disaster and expressed his thanks to the Palestinian factions which provided relief help for the affected citizens. Al-Qassam Brigades, the armed wing of Hamas, said its resistance fighters have participated in the rescue and relief efforts taking place in the areas affected by floods in the besieged Gaza Strip. Al-Qassam Brigades has put its human and material resources at the disposal of the authorities in Gaza and helped evacuate many families and citizens from the flooded areas. 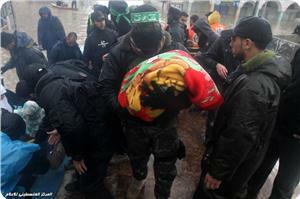 Many Qassam fighters were seen with their cars and tools helping people in the areas affected by the rainstorms. Citizens reported that resistance fighters from Al-Qassam Brigades evacuated dozens of helpless families in Gaza city, Rafah district and Deir Al-Balah district to schools and other centers used as makeshift shelters and provided them with emergency aid. In addition to the evacuation of citizens from the affected areas, Al-Qassam Brigades provided first aid for the injured citizens, transported them to hospitals, protected evacuated homes and took livestock owned by citizens to safe places. Members of the Brigades also established mounds of dirt and barriers of sandbags in the areas covered by rainwater to stop its flow to other homes.